Every so often, a particular food that has been around for centuries makes a massive resurgence on the market thanks to it's amazing health properties. We've seen this with chia seeds, acai berries, goji berries and even humble green tea. Now, despite having been used by humans in Europe and Asia for hundreds of years (Ancient Greek scholars even wrote about it), Sea Buckthorn is making it's mark on the North American market. Thanks in part to publicity from Dr. Oz, these small yellow to bright orange egg-shaped berries that taste similar to tart oranges are being used to produce a slew of medicinal and health products. From it's juice to it's oil, this berry has been touted as a skin miracle, protecting it from the sun, heat, chemical and radiation burns, eczema and poorly healing wounds. It's juice is very high in protein, vitamins C and E, and organic acids. It's oil is rich in vitamin E, carotenoids, phytosterols and essential fatty acids, all of which make it perfect for the treatment of internal and topical maladies such as stomach and mouth ulcers, inflamed gums, constipation, acne and eczema. The Sea Buckthorn is also rich in calcium, iron, manganese, folic acid, beta carotene, lycopene, zeaxanthine and flavonoids. Another point that makes Sea Buckthorn oil unique among superfoods is that it contains a rare omega-7 fatty acid that has been associated with weight loss, as it reportedly prevents the storage of fats in the body. It also contains heart healthy omega-3 fatty acids as well as the more common but also important omega-6 and 9 fatty acids. Now that it is being grown in the Canadian Prairies, products from the Sea Buckthorn, also known as the Sea Berry or Siberian Pineapple, are starting to dot shelves in Saskatchewan and Winnipeg, among other places. 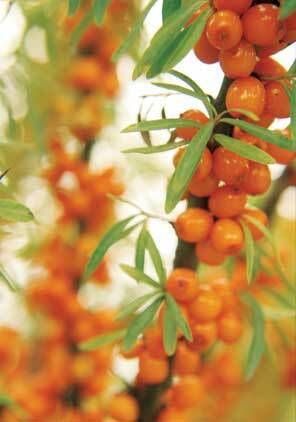 Look out for juices, oils, jams, teas and even energy bars made from this superfood. Can't wait to try some!